In addition to enriching the decor of your kitchen with its sleek stainless steel canopy design, this island ventilation hood will remove smoke, grease, odors and moisture from the kitchen. A powerful 450 CFM blower circulates the kitchen air. The hood's design allows installers to connect the exhaust vent to your home’s duct work from the top of the unit. Durable grease filter collects the grease that builds up from cooking and removes quickly and easily for cleaning. The Ventilation Hoods Profile™ 36" Island Hood by GE Appliances at Del Sol Furniture in the Phoenix, Glendale, Tempe, Scottsdale, Avondale, Peoria, Goodyear, Litchfield, Arizona area. Product availability may vary. Contact us for the most current availability on this product. With a GE range hood, smoke, odors and grease are removed from your kitchen. 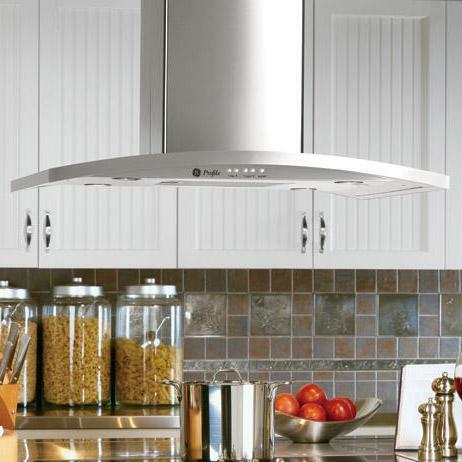 GE venting hoods are available in 24-inch, 30-inch, 36-inch” widths, for a perfect fit over our ranges and cooktops. Typical range hood as supplied by many builders removes heat, smoke and odor from the kitchen, with venting performance from 160 CFM to nearly 400 CFM. The blower may have two to four speeds and variable lighting levels.Stainless steel designer hoods are are quieter than traditional hoods, yet offer up to 600 CFM to remove smoke and cooking vapors from the kitchen. Slide-out hoods offer a venting alternative to a typical range hood installed over a cooktop. When not in use these kitchen hood slide back nearly flush with the front of the cabinet, leaving only a thin, one-inch strip visible. When cooking, pull it forward and turn it on. It even has a cooktop lamp. The Ventilation Hoods collection is a great option if you are looking for Appliances in the Phoenix, Glendale, Tempe, Scottsdale, Avondale, Peoria, Goodyear, Litchfield, Arizona area. Browse other items in the Ventilation Hoods collection from Del Sol Furniture in the Phoenix, Glendale, Tempe, Scottsdale, Avondale, Peoria, Goodyear, Litchfield, Arizona area.